Those of you who know who I am are undoubtedly aware that I helped figure out who the killers were in two murders. I had to get involved the first time since I was the main suspect, and a good friend was the primary suspect in the other one. Well, guess what. Another murder has occurred in my wonderful adopted town of Knobcone Heights, California--and, yes, I'm involved again. That story is going to be told in a book that will be published in May of this year: Bad to the Bone. I won't tell you any of the particulars now but I'm sure you can guess that another friend, or at least an acquaintance I care about, is the main suspect. I've learned a little about how to find a real killer, but even so I never set out to become an amateur sleuth. Being the owner of Barkery & Biscuits, the wonderful bakery of healthy dog treats that I created, and its adjoining human bakery Icing on the Cake, is time-consuming enough, especially since I still work part-time at the Knobcone Veterinary Clinic as a vet tech. That's where I developed my recipes for the Barkery. Anyway, whether or not I set out to get involved, I am involved. You can find out more in a couple of months. 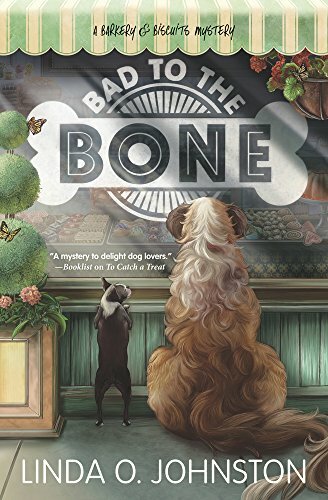 BAD TO THE BONE, the third Barkery & Biscuits Mystery by Linda O. Johnston, will be a May 2017 release. And yes, there are more to come. The title alone is a winner. You keep very busy Carrie. So glad Linda O. Johnston can find you more crimes to solve. Best of luck with the new book. Thank you, GBPool. I'm definitely kept busy, as you noticed, and not always with what I want to be doing. But at least I feel I'm accomplishing good things--mostly. Awesome title! Can't wait to read it. Thanks, Donamae. Hope you enjoy it!